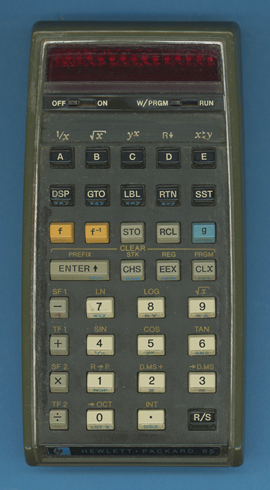 Hewlett-Packard introduced in January 19, 1974 with the HP-65 the first truly handheld programmable calculator. In a housing slightly larger than the HP-35 a card reader for tiny magnetic strips was accomodated. Users could store programs up to 100 steps lenght on the cards or buy pre-programmed cards from both Hewlett Packard or third party companies. The HP-65 was replaced after 2 years with the HP-67 featuring 224 merged program steps and 26 memories instead of 100 partially merged steps and 9 memories. Compare the specifications with the Texas Instruments SR-56 and SR-52. The HP-65 uses the Reverse Polish Notation with the ENTER key instead the usual = key. The internal view of the HP-65 gives a very solid construction. The main printed circuit board with the huge CPU and three ROM's (Read Only Memories).